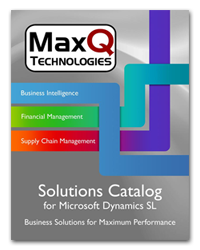 MaxQ Technologies has released two new MaxQ product catalogs with detailed information on our line of add-on modules for Microsoft Dynamics SL and Microsoft Dynamics GP. 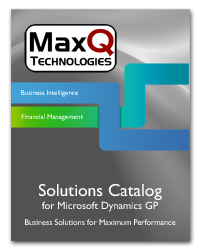 Inside these colorfully designed catalogs you’ll find all of our products from our Business Intelligence Series,Financial Management Series and our Supply Chain management series, as well as information on our newest products Lock Box and Auto Kitting. Click the images below to begin downloading our new product catalogs!